Sublime was an American ska punk band from Long Beach, California, formed in 1988. 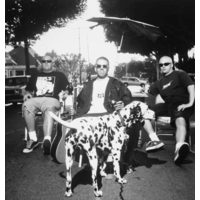 The band's line–up, unchanged until their breakup, consisted of Bradley Nowell (vocals and guitar), Bud Gaugh (drums and percussion), and Eric Wilson (bass guitar). Michael "Miguel" Happoldt also contributed on a few Sublime songs, such as "New Thrash." Lou Dog, Nowell's dalmatian, was the mascot of the band. Nowell died of a heroin overdose in 1996 and Sublime immediately split up. To date, Sublime has released four studio albums, one live album, five compilation albums, three EPs and one box set. The band released its debut album 40 Oz. to Freedom in 1992. Although the album was quite popular in the United States, Sublime would not experience commercial success until 1996 with their self-titled third album, released shortly after Nowell's death, which peaked at number 13 on the Billboard 200, and spawned the single "What I Got", which remains the band's only number one hit single (on the Billboard Alternative Songs chart) in their musical career. The self titled album is now considered a classic ska album by fans and critics. As of 2009, Sublime has sold over 17 million albums worldwide, including about 10 million in the U.S. alone. Along with Bad Religion, Green Day, The Offspring, and Rancid, Sublime is credited with helping to revive mainstream popular interest in punk rock in the United States in the mid-1990s. In 2009, the surviving members decided to reform the band with a new lead singer and guitarist Rome Ramirez. However, weeks after performing at Cypress Hill's Smokeout Festival, a Los Angeles judge banned the new lineup from using the Sublime name. This was because Nowell had owned rights to the Sublime name. In January 2010, the lawsuit was settled and the new lineup now performs together as Sublime with Rome.